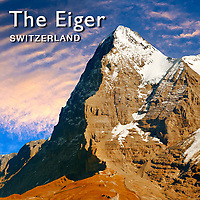 Eiger Swiss Alps pictures. Fotos & images of the Eiger North Face. Eiger travel pictures, photos & images to buy as stock or prints. The Eiger (3,970 m (13,025 ft)) is a mountain in the Bernese Alps in Switzerland. It is the easternmost peak of a ridge crest that extends across the Mönch to the Jungfrau at 4,158 m. The northern side of the mountain rises about 3,000 m (9,800 ft) above Grindelwald and other inhabited valleys of the Bernese Oberland, and the southern side faces the deeply glaciated region of the Jungfrau-Aletsch, covered by some of the largest glaciers in the Alps. The first ascent of the Eiger was made by Swiss guides Christian Almer and Peter Bohren and Irishman Charles Barrington, who climbed the west flank on August 11, 1858. The north face, 1,800 m (5,900 ft) (German: Nordwand, "north wall"), was first climbed in 1938 by an Austrian-German expedition and is one of the six great north faces of the Alps. Since 1935, at least sixty-four climbers have died attempting the north face, earning it the German nickname Mordwand, literally "murder(ous) wall".